Subject: How Do Tariffs Impact Interest Rates? Investors are well aware of the potential impact President Trump's tariffs could have on the economy. 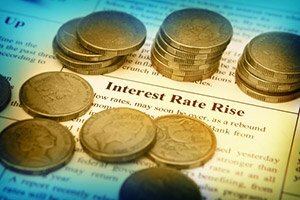 However, almost everyone is overlooking the impact tariffs will have on interest rates. You see, tariffs will cause inflation to rise, pushing the U.S. Federal Reserve to counter rising inflation by aggressively raising interest rates. Higher interest rates caused by steel tariffs will have a negative impact on the health of the stock market – and your portfolio. Money Morning Capital Wave Strategist Shah Gilani believes that most investors aren't positioned to handle the negative effects of rising inflation. "The inflation genie's about to be unleashed, and traders and investors have only been talking about it – they're not ready for it," he says. However, Shah has a strategy to help investors position themselves for profit – one that will protect your portfolio from inflation and interest rate hikes caused by steel tariffs. The Consumer Price Index (CPI) – a measure of the change in the price of consumer goods – has remained below 3% for the last 20 years. However, Shah points out that the cost of raw materials needed to produce consumer goods is rising at a breakneck pace – indicating that we are barreling toward a higher rate of inflation and a spike in the CPI. "Inflation numbers have been ticking up, but underlying prices of everything economies use to generate so-called GDP growth have been soaring," Shah said. "The price of industrial materials, used to manufacture almost everything, is up 25% over the past 52 weeks. Cotton is up 25%. Energy, as measured by West Texas Intermediate crude, is up 48%." As the cost of purchasing raw materials rises, companies attempt to offset manufacturing costs by raising the sale price of their goods – inevitably leading to higher inflation. The Trump administration's new steel tariffs are only likely to contribute to the rising cost of raw materials. According to the Aluminum Association, over 60% of the nation's aluminum supply comes from imports. As a result, a 10% tariff on aluminum will lead to higher prices for everything from soda cans to pickup trucks. And any increase in the rate of cost of goods is sure to spook the Federal Reserve. The Fed itself is already predicting three rate hikes this year according to its dot plot, and analysts are even predicting there could be four in the next year. As Trump's steel and aluminum tariffs push inflation higher than previously expected, the Fed is likely to counter with additional interest rate hikes – hikes that are sure to rattle investors and upset the market. According to Statistics Portal, last year's CPI was 246.38. Analysts see the CPI hitting 258.9 in the next two years – a significant increase of over 2.5% per year. However, if Shah's inflation projections are correct, then this estimate is far too conservative, even before you factor in the impact of tariffs. This leaves the unprepared investor in for a shock. That's why Shah has found a profit play that will help you protect your portfolio from tariff's impact on interest rates. Shah's plan is a strong investment in the security of your portfolio – one that will protect your investments from the market's tariff-induced turmoil.